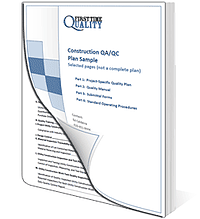 Basic Construction Quality Programs for general and specialty contractors — cover all the essential elements of a well-formed QA/QC Program without a lot of added detail. All Basic "Essentials" Quality Programs costs $295, but NOT all essentials plans are the same. Your plan will be based on your requirements. So, if your specification require more, we'll add additional forms and sections. Your Quality Program will be personalized with your company logo, company name and project name make a very nice, professional presentation.